‘Liesl lives in a tiny attic bedroom, locked away by her cruel stepmother. Her only friends are the shadows and the mice,until one night a ghost appears from the darkness. It is Po, who comes from the Other Side. Both Liesl and Po are lonely, but together they are less alone. This book, put simply, is magical. It is beautifully written and although it addresses issues like death and ghosts Oliver manages to write them in a way that is suitable, and comforting to those reading. At the end of the book she explains that the idea for Liesl and Po came after she lost a friend, and there is definite loss in Liesl and Po – with Liesl losing her father, Po losing his connection with the living and Will losing his childhood to the Alchemist. Loss, and especially involving death is a very difficult thing to articulate and write in a sensitive, and non offensive way. Oliver does this beautifully, and I think that Liesl and Po would be a great book for children who have lost somebody to help them make sense of this loss in the same way that Liesl does. 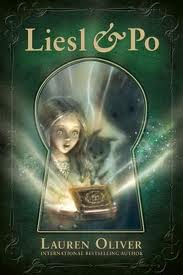 Liesl is our main character and at the start of the book is locked in her bedroom by her cruel stepmother when the ghost Po, and his/her (Po has forgetten his/her gender) and his adorable pet Bundle, a dog or cat. She eventually mets Will, who accidentally switched her fathers ashes with a powerful magic. I loved Liesl, she is clever, brave in the face of adversity and determined to put her beloved father to rest in the right way. The plot was very simple. There was no mysery or twists or turns, from the beginning I pretty much knew what was going to happen. This, I think was the one drawback of the book although younger readers mind not as mind it as much as I did. That being said, the word that springs to mind whilst discribing Liesl and Po is classic. The evil stepmother, being locked in a tower, magic and a Lady Premier that is after it at all costs. It had elements of classic fairytales in it. This I loved, it added to Liesl and Po’s whimsical nature and I absolutely love fairytaleesque books! Liesl and Po is a charming novel, full of lovable characters and a delighfully written prose by Lauren Oliver. As much as I loved Delirium and Pandemonium I hope she decides to delve into middle grade again. A great, but at times sad novel for children, although I feel that the enduring message of Liesl and Po is hope. Hope you enjoyed my review. Happy reading!